Witches' Sabbath is a 1798 oil on canvas by the Spanish artist Francisco Goya. Today it is held in the Museo Lázaro Galdiano, Madrid. It is one of six of Goya's paintings on the subject of witchcraft which were owned by the Duchess of Osuna. Their origin is unknown; they may have been commissioned or bought by the liberal Duchess after they were completed. 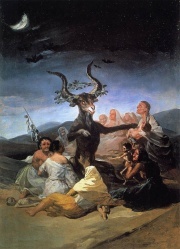 Goya used the imagery of covens of witches in a number of works, most notably in one of his Black Paintings, Witches' Sabbath or The Great He-Goat (1821–1823). Interest in the supernatural was a feature of Romanticism, and is to be found for example in Weber's opera Der Freischütz. However, in a Spanish context, Goya's paintings have been seen as a protest against those who upheld and enforced the values of the Spanish Inquisition, which had been active in Witch hunting during the seventeenth-century Basque witch trials. The later Witches Sabbath was painted as a bitter struggle raged between liberals and those in favour of a church and a royalist-lead state, which culminated in the so-called Ominous Decade (1823-1833). Both paintings can be seen as an attack on the superstitious beliefs rife in Spain during a period when tales of midnight gatherings of witches and the appearance of the devil were commonplace among the rural populace. They reflect the artist's disdain for the popular tendency towards superstition and the church-led return to medieval fears. Goya's depictions of such scenes mocked what he saw as medieval fears exploited by the established order for political capital and gain. Unless indicated otherwise, the text in this article is either based on Wikipedia article "Witches' Sabbath (Goya, 1798)" or another language Wikipedia page thereof used under the terms of the GNU Free Documentation License; or on original research by Jahsonic and friends. See Art and Popular Culture's copyright notice. This page was last modified 08:08, 13 October 2012.